Starting on p 165 9/05 issue of Excellence, there is a very nice write up on how a Boxster based racing series may develop. Lots of nice tech issues on brakes, weight, etc. that you track types may find interesting. Directly following that, the tech guy covers the process for changing plugs in the Box. Again, good stuff. Also, full tech review of the Cayman is included. Finally, the Market Update covers Boxster pricing of late. 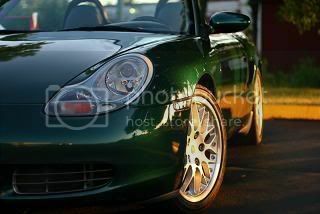 And a Boxster racing series would have to bring more aftermarket performance goodies. I'm all for it. Say, wasn't that a yellow box in Excellence? yep, sure was. Kind of looked like lemonjello. buying a 2000 2.7 help! hi, I am buying a 2000 2.7 boxster privately and need some advice. the car has no service history and 47000miles or 75000 klm. it was never damaged or crashed and is in general excellant condition-what should i be looking for?? ?uk author. Try to have a Pre Purchase Inspection. If you are not going to do that at least have a Carmax report ran on it,scan over tires to see if they are mismatched,check for manuals(all of them),ask for records/receipts,see if it has had a RMS failure before, make sure it is up to date on recalls and most importantly make you enjoy it! Do a search here on the topic. TONS of good posts on the subject. A PPI and a Car Fax are MINIMUM standards in my book. Contact me or see my other posts in the other form for more information. This was my experience buying a 2000 Boxster with 42,000 miles on it. I bought it from the local BMW dealer who took it in on trade. It had two previous owners, the last owner had the car for 2 years and the dealer swore she took excellent care of the car and did all the required service, but there was no paperwork on service done to the car. The BMW dealer also said they checked the car over and it was in great shape. I had the carfax on the car and there were no indications of abuse, so I bought the car without first having an independent check it out because the dealer gave me a 1 month/1000 mile return on it. I took it to the local Porsche dealer to have it checked out and found that it had likely never had any service except for the oil changed. They said it had the original cabin filter, plugs and likely, original air filter. I got what I thought was a good deal on the car, so I kept it and had the 30K service done on the car. And it ran fine with only an oil change done until 30k? As far as I can tell, the car had been getting regular oil changes, the oil was very clean when I checked it. The first owner sold the car when it had 31K on it and never did the 30K service. The second owner thought the 30K service was done, so it looks like she just did oil changes. I asked the Porsche mechanic that was checking the car over what he thought about that history, and he said he thought it would be fine. The engine was nice and dry with no leaks, no error codes and the car seems to run great. Time will tell. It really was an education in car dealers. The BMW dealer that I bought it from said he knew the last owner, a worman, that had the car for the last two years. And even though there was no paperwork, he swore that the woman did all the regular service intervals on the car. She lived in Virginia Beach and I called the Porsche dealership there, they had never seen the car. Somehow I thought a BMW dealership would be more responsible. should be a VERY popular and fun series. Trav C - Plug in. Take off. As a person who can only affrod used Porshes, and having owned 6, I have to say in general it has been my experience that most folks who buy a new Porsche take very good care of thier investment. Certainly smart to have to pre-check, but in general these cars are not lacking in the preventive maintenane department. In fact I have documented recods of one older 911 I purschased of synthectic oil changes every 2K, since purched ! A little extreme! I suppose leasing now a days may have some effect, but I still think most like myself treat these things pretty darn good. Heck I recently rented a Hertz Shelby Mustang, just to check it out for week and had the car washed before returning it! Wow, can we try to stay on topic here? Boxster Racing... Chills is all for it! Like limoncello said, more aftermarket goodies. I can also see myself getting into something like that at the track. It's not about the summit, it's about the climb. I understand your issues with Reeves--I experienced the same. I bought my 03 Boxster with 33K miles from a Porsche dealer. It was a new car trade bought originally at the dealer. I had the name of the previous owner and all the records. The car was Porsche certified, plus a few months remaining on the new car warranty. Porsche replaced one of the front headlamp assemblies when I found it was fogging when I washed the car. That's $1000 saved. I have had to get a new battery this winter, not covered, but not unexpected and inexpensive. Otherwise, everything perfect. The bottom line is I buy my Porsches at a Porsche dealer, and Porsche certified. It costs the dealer $1500 or so for the certification, so they only do it on their best cars. And my dealer prices are very competitive with private sales. The magazine seems to be very interesting to me as a beginner in driving and familiarizing my car.I'm still on a learning process on how everything goes with a car.I will look forward reading the whole article. Ok so now the next question. With a header.... Use a traditional header gasket? Or use a nice new OEM stamped steel manifold gasket. I know from experience with Fords that a header gasket is a HUGE no no when using OEM manifolds. It will cause manifold damage, and broken studs. This is due to the "header gasket" blocking heat transfer between the manifold and head.